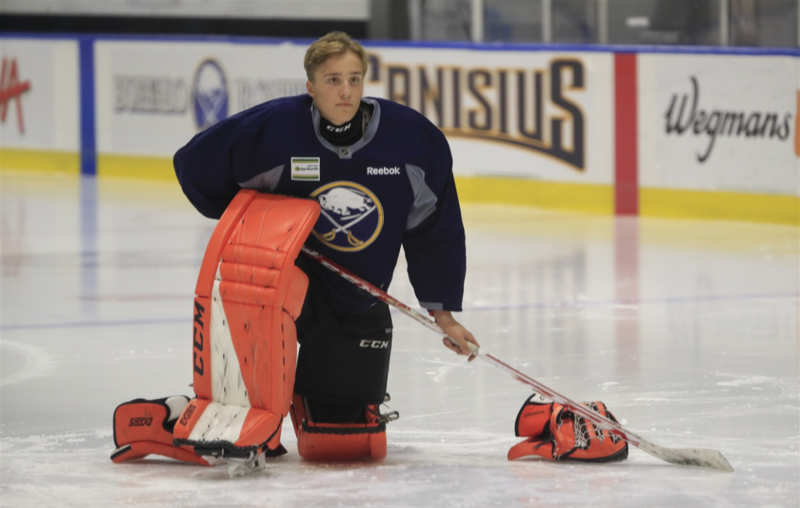 The 20-year-old goaltender from Finland was playing on an amateur tryout contract. Luukkonen made 20 saves in the third period, shutting out the Senators in the period. Belleville was desperate to win in order to clinch the fourth and final Calder Cup playoff spot in the American Hockey League’s North Division. The loss and Cleveland’s win at Toronto gave the Monsters the No. 4 position in the North Division playoffs and first-round matchup with the Syracuse Crunch in the opening round. Despite his heroics, Luukkonen was not awarded one of the game’s three stars on Sunday. The first star went to the Amerks’ Taylor Leier, who scored his 21st and 22nd goals of the season. Leier spent part of the season with the Lehigh Valley Phantoms before he was acquired by the Sabres. The second star went to the Amerks’ Tage Thompson, who scored his sixth goal and made his third assist in just eight games in the AHL this season. Leier’s first goal Sunday came on the power play with assists from Wayne Simpson and Kyle Criscuolo and tied the game at 1-1 at 10:29 of the first period. His second goal, also on the power play, made it 2-1 at 12:37. Simpson picked up his 23rd assist and Thompson assisted on the goal. Thompson put the Amerks ahead to stay, 3-2, at 14:25 of the second after Jack Rodewald’s goal had tied the game for Belleville.